It was expected to be just another lump of dull basalt, but the first rock examined up close by NASA’s Curiosity rover on Mars proved to be a little more interesting. The pyramidal object, nicknamed “Jake Matijevic” after a recently deceased mission engineer, had a composition not seen on the planet before. Scientists have likened it to some unusual but well known rocks on Earth. “[The rock is] widespread on Earth, on oceanic islands such as Hawaii, and St Helena, and the Azores; and also in rift zones like the Rio Grande and so forth. So, again, it’s not common, but it’s very well known,” the mission co-investigator from the California Institute of Technology, Pasadena, told reporters. The Curiosity rover examined Jake Matijevic three weeks ago. At the time, the dark rock was not anticipated to have high science value; it was merely an early opportunity to use the robot’s survey instruments in unison. Jake Matijevic also had an interesting, weathered appearance that drew attention. 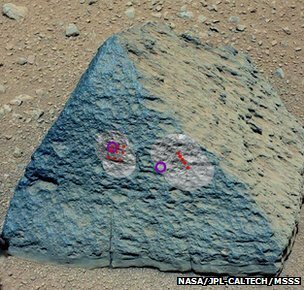 The rover first zapped the rock from a distance with its ChemCam laser, and then moved in close to study it with its X-ray spectrometer known as APXS. The latter device is held on the end of the rover’s robotic arm; the laser is mounted on its mast. Jake Matijevic was found to be high in elements consistent with the mineral feldspar, such as sodium and potassium, and low in elements such as magnesium and iron. Prof. Edward Stolper compared the signatures with a catalogue containing thousands of Earth rocks, and determined the nearest match to be an igneous type, the formation of which he likened to the production of colonial apple jack liquor. This saw barrels of cider left outside in winter to partially freeze. As the barrels iced up, they would concentrate the apple-flavored liquor. A similar process was occurring in the liquid magma several kilometres underground that gave rise to alkalic rocks like Jake Matijevic, said Prof. Edward Stolper. “In the case of the apple jack, you take out water and concentrate alcohol; in this case you take out particular minerals – olivines, pyroxenes and some feldspars – and you generate a liquid that is very different to what you started with,” he explained. Curiosity landed in Mars’ equatorial Gale Crater in August, and has driven eastwards almost 500 m since then. It is currently stationed just short of a point called Glenelg, where satellite images have revealed a juxtaposition of three different types of terrain. Scientists expect this location to be a good starting point to begin characterizing the geology of Gale. The mission is going through something of a lull presently while the rover spends a few days preparing its sample handling system. It is running dirt through this equipment to scrub surfaces free of any residual contamination from Earth. This is necessary to avoid skewing the analyses of rock and soil samples delivered to the rover’s onboard laboratories later in the mission. Curiosity’s goal is to try to determine if Gale ever supported environments that might have allowed microbial life to flourish. In the short time it has been on the ground, it has already identified rocks that were clearly deposited in fast running water. The theory is that the rover is sitting at the head of an ancient alluvial fan where a network of streams cut across the crater floor billions of years ago.